Butterfly koi are a distinct variety of koi which are prized by those who are looking for something different. They come in a variety of patterns and sizes, all of which display a vibrant color. To learn more about these fish, it is first important to understand their origin, and how they were bred. During the 1980s, a group of long finned, grey and brown carp was discovered in Indonesian canals. A New York firm became interested in these fish and then purchased them, selling them throughout the United States. 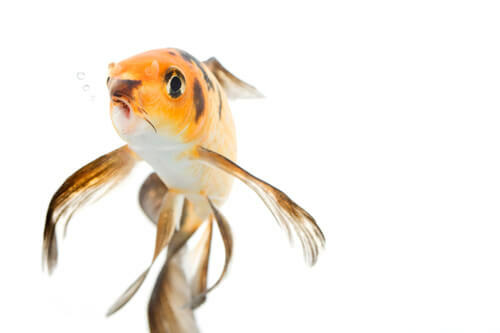 Sales were not strong, since the fish were found to be unattractive, but a breeding consortium purchased some and over a few years begin breeding them with standard koi, leading to spectacular and unexpected results. The genes responsible for the long fins were dominant, which meant breeding back the fish color would not remove it. It was also found that the longer fin koi were exceptionally healthy and resistant to disease. Once the color was bred back, a variety of lines could be produced. Blue Ridge Fish Hatchery, the breeder responsible for making this discovery, could be considered the creators of butterfly koi. During their growth cycle butterfly koi will become more beautiful since their fins will continue growing longer than normal koi. This will occur until their blood vessels can no longer maintain them. In other words, older fish will have fins which are the longest and most impressive, giving them a regal appearance which resembles an Asian styled dragon. Their barbels also grow long and may transform into designs which are unusual and elaborate. Butterfly koi tend to lack the body size which is found with normal koi, but their combination of long finnage and bright colors make them stand out. One thing which is important when measuring the value of these fish, and regular koi, is their patterns. Platinum or lemon ogons which are solid in color are especially prized. Any collector or breeder who is able grow their butterfly koi to a big size in these metallic colors will have a fish which is extremely valuable, to say the least. Which Butterfly Koi Are The Most Prized? Arguably the most popular type of butterfly koi is the Sorogoi. These fish display a greyish color with a black net pattern over their bodies. The colors give the fish a mysterious aura as it moves through the water like a sea monster. Other popular variants include black butterfly koi, but the rarest fish within this class are the Karasu, or black koi, which has exceptionally long fins and which is free of scales. These fish tend to be become quite large since their genes are not subject to the restrictions of their brightly colored counterparts. Since they have no scales, their bodies are jet black.